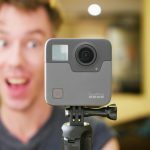 Home » 360 Action Cameras » Insta360 One X Review: GoPro Hero Killer? Insta360 One X Review: GoPro Hero Killer? The Insta360 One, released in late 2017, is one of my favourite 360 cameras; it’s small, easy to use and has epic stabilization. It’s not without it’s limitations though, for example the camera is limited to shooting video at 4K resolution which doesn’t really cut it these days, and you need to physically connect the camera to your phone to preview your shots. Enter the Insta360 One X, the sequel to the Insta360 One and a big upgrade in terms of how it shoots video. The Insta360 One X can shoot 5.7K 360 video, 4K at 50fps and 3K at 100fps, it features the same (or even slightly better) amazing stabilizaion that removes the need for a gimbal and, mercifully, Wifi preview and transfer. I’ve been using the Insta360 One X for a week or so now and I’m impressed with what I’ve seen. I could go as far as saying that this might be the best value (but not the best) 360 camera yet, but I’ll let you be the final judge. A huge upgrade from their last camera and almost certainly the best value 360 camera out right now. Get an Insta360 One X with a Free invisible selfie stick with this exclusive offer. Insta360 One X or GoPro Fusion? I tend to not make a big deal of “unboxing” or what’s in the box of a camera or gadget, although some reviews seem to make a big deal of it so here it is, everything that came in my Insta360 One X box. When un-boxing the Insta360 One X you’ll notice one thing, there are a lot of cables. Don’t let that worry you, you’ll probably only need one of them. 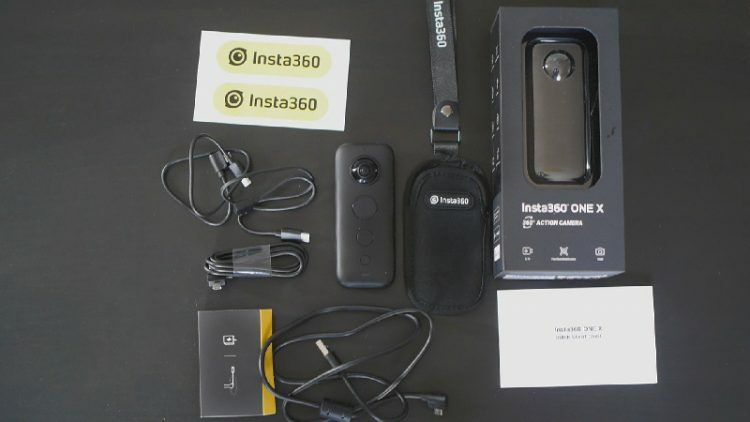 While the Insta360 One X features WiFi transfer, you also have the option of connecting manually via USB and Insta360 provides you with a variety of cables so you are ready to go regardless of which phone you use. Once nice addition is the soft carry case with a strap, a vast improvement on the hard shell that came with the original Insta360 One. The instruction book informs you how to set up your new camera and not much else. You’ll also receive some Insta360 stickers to adorn your laptop with. The One X has seen a significant redesign compared to its predecessor. It’s larger, longer and features an LCD screen. The latter is an excellent and welcome addition, and allows you to exert a lot of manual control without having to connect to your phone. Two buttons, one large and one small, are located below the screen and are used to navigate the menus and select options. You have access to the full capabilities of the camera from this menu system and can change anything from video resolution to gyro calibration. The materials used in the construction of the camera are neither the most premium looking or feeling, but that is reflected in the very reasonable price. It seems to be mostly made of a type of toughened plastic which is easy to grip, reducing the changes of it slipping out of your hand. 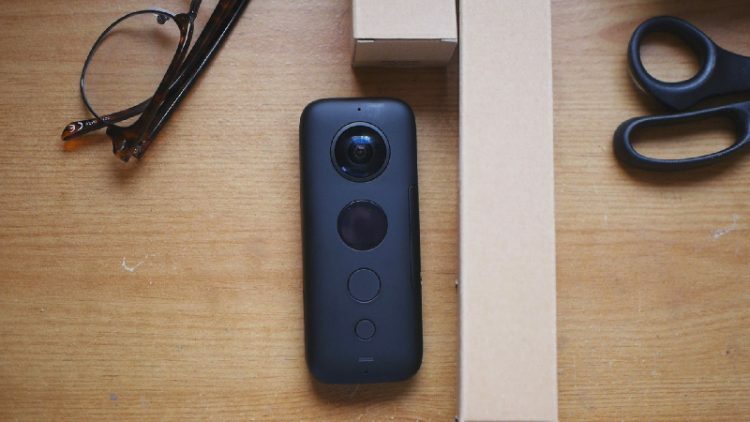 The candy bar shape is an ideal shape for a 360 camera, allowing it to sit on a flat surface without falling or be used handheld. Of course the best way to use these cameras is with a selfie stick or tripod, and the standard adaptor for both can be found on the rear of the camera. A door on the right side of the device houses the removable battery; the previous version of the camera had an irremovable battery which tended to deplete quickly, so it’s good to know that you can have some spares ready for this new version. The Insta360 One X is essentially an action camera. 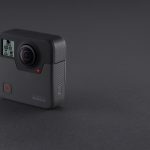 Not only is it competing with other 360 cameras, but it’s taking aim at traditional action camera like the GoPro Hero. 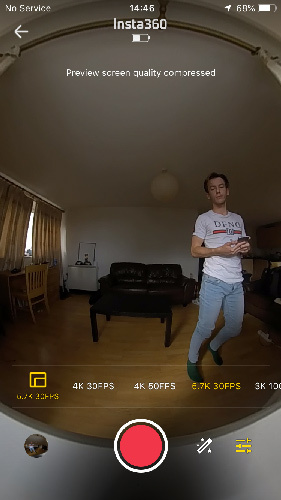 When you shoot 360 video you have the option of cropping it down into a “normal” flat video, but with the option of choosing exactly where you want the camera to be pointing. This is all done in editing and can be summarised as “shoot first, point later”, but is usually known as overcapture. You can create some epic videos with this editing method, but it requires huge resolutions to look good. The original Insta360 One could shoot in 4K, which sounds impressive but actually resulted in overcapture video that didn’t always look great. 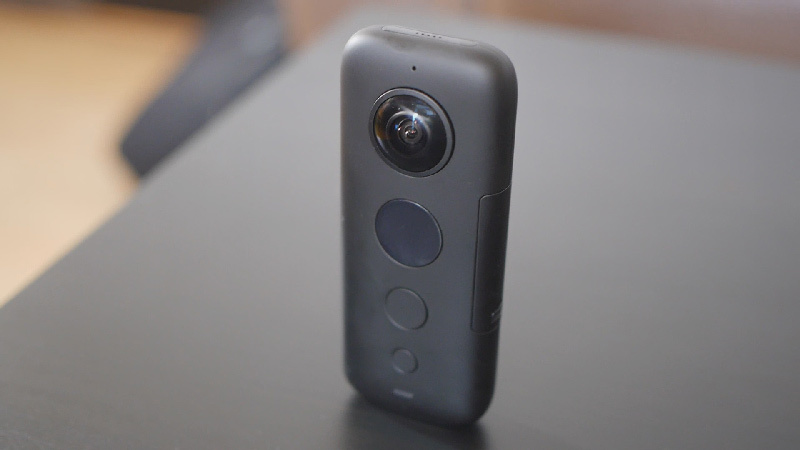 The new Insta360 One X not only has a much improved video resolution of 5.7K (5760*2880), but its lenses are much more adept at picking up details and color. Creating the overcapture video now results in footage that looks HD rather than SD. 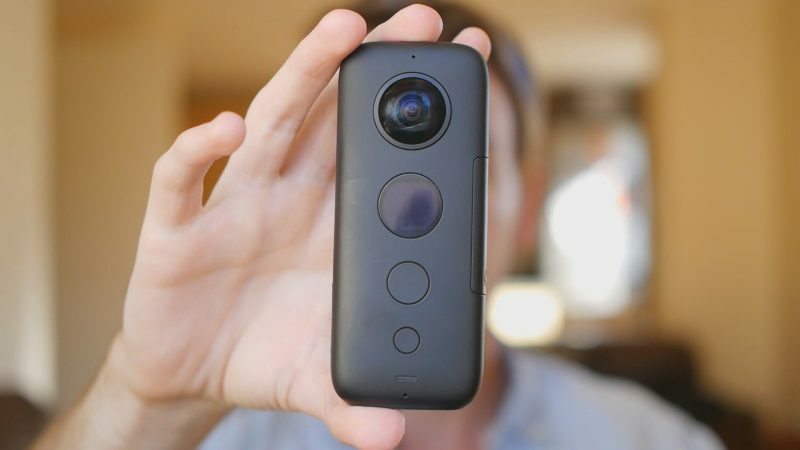 This, mixed with the amazing stabilization that’s only possible when using a 360 camera, means that the One X is now a viable alternative to traditional action cameras for shooting moving videos. If you are more interested in shooting in the 360 format for VR, then the bump in resolution is good news. Only a few other 360 camera can shoot at 5.7K, and I’ve found that this is really a minimum if you want to shoot for VR viewers. The camera can tend to overexpose direct sunlight, but other than that is deals with colors and light reasonable accurately. I’ve taken a look at the final rendered video files and the maximum bit rate seems to be 70mbps. Bit rate is important and the higher the better. In this case 70mbps is not bad, but other 360 cameras can go as high as 100mbps and there will certainly be a noticeable difference in quality. You have the option of shooting video in “LOG” mode, which is essentially a type of RAW video format. I suggest you keep this option on, as doing so seems to improve the overall look of your video. 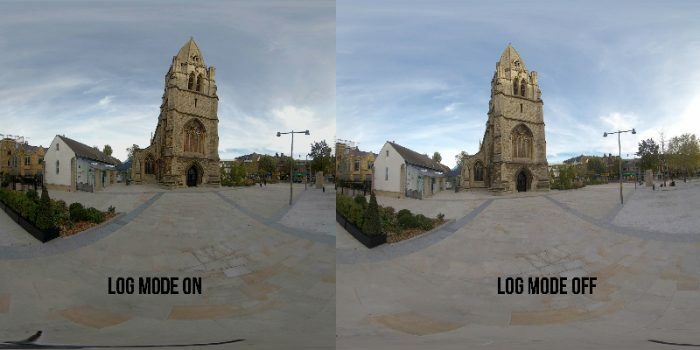 Take a look at these comparisons with LOG mode on and off. You’ll notice that the video with LOG mode on tend to be be brighter with more color and less noise. Overall I’m pretty impressed with the video coming out of the Insta360 One X, it’s certainly the best camera in this price range for video. Other 360 camera that can shoot in 5K, such as the GoPro Fusion and VIRB 360, are much more expensive, and the only other cheaper one, the Yi360, lacks any kind of stabilization. The combination of clear, high res 360 video, amazing software stabilization and overcapture editing makes the One X an excellent camera for shooting for VR and a viable alternative to a GoPro action camera. As you can see the video looks noticeably better with HDR mode on. The One X is the only consumer 360 camera out right now with this feature. While I would not describe the One X as a camera designed for 360 photography, it doesn’t do a bad job if you just want to shoot for social media. The One X can shoot 360 vphotos at a resolution of 18 megapixels, which is actually less than the previous version. 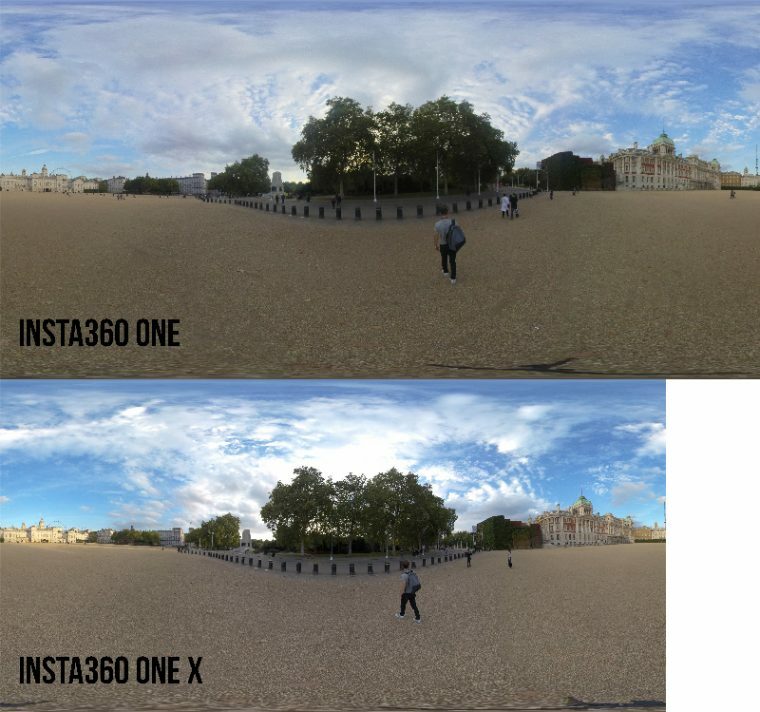 I’m not sure why the resolution could not at least be maintained and it may seem disappointing to those who enjoyed using the original Insta360 One for photography, but alas, all is not lost. While the resolution is lower, the lenses have improved, which is actually more important for the overall look of the photo. Light and color are captured with excellent precision, and a HDR mode improves dynamic range even further. Low light is captured with far less noise, but it’s still a struggle to get a good shot in darker areas. Take a look at the comparison below to see the difference between the photographic capabilities of the two cameras. The One X may shoot an overall smaller image, but pretty much everything else is better. The One X can also shoot RAW photos which opens up a lot of editing options for those who like to tinker with their images after they are taken. The lower pixel count won’t really matter a great deal when viewed on smaller screens (where almost all 360 photos are viewed), and the improvement in almost every other aspect of the cameras imaging capture capabilities more than makes up for it. When connected via Bluetooth to your phone, the One X will embed GPS data into your 360 photos, allowing you to use the camera for Google Street View photography. While it might be a stretch to recommend the One X for professional virtual tour photography, it’s certainly more than capable of creating amazing tiny planets or capturing 360 shots of your every day like. One area where MANY 360 camera fail is software, specifically when it comes to viewing and editing. The original Insta360 struggled in this area too, until several updates dramatically improved the situation. The One X is a newly released camera and I’ve encountered a few hiccups and the odd crash, which is annoying but forgivable. I’m able to tolerate this thanks to the amazing video editor which is super user friendly and allows you to truly create stunning videos right from your phone. 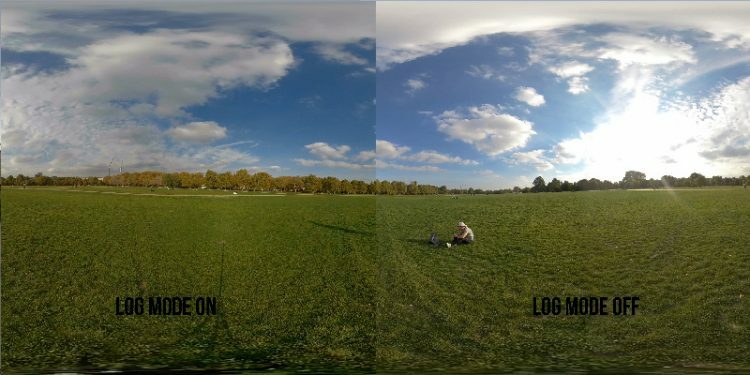 The One X app allows you to preview and control your camera over WiFi. I’ve found the connection to be relatively stable and the option menus very east to navigate. I did find that the signal weakened when I moved more than a few metres away and transferring files took longer. The software truly shines AFTER you’ve shot your video and you want to edit it. I won’t give you a full tutorial in this review because it would take too long! Essentially you can take your 360 video and with a few simple commands, turn it into a normal video with super smooth panning, slow motion and hyperlapse effects all in one. You can also edit the look of your video with filters or manual color and light controls. If you used the Insta360 One to create these types of video then the options are pretty similar, but if you are new to this type of editing then it may seem complicated. Trust me it isn’t. You’ll also want to download the Insta360 Studio desktop software, particularly if you want to render the 360 video at the maximum 5.7K resolution. The phone app isn’t powerful enough to render and stitch such large videos, but the studio will make quick work of it. You can also implement stabilization and a few video effects using the studio too, but I actually find the phone editor more intuitive. 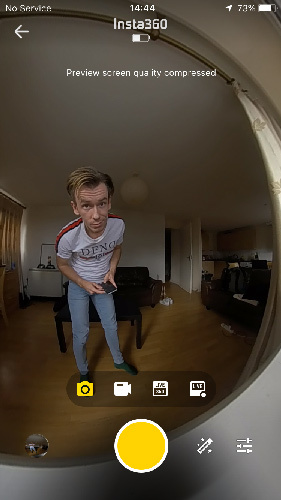 Livestreaming: I haven’t’ actually tested this out yet, but I know it works well on other Insta360 products. 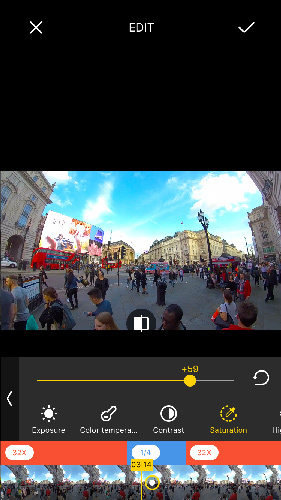 You can choose to livestream in full 360, where the viewer can move around and look at where you are, or in freecapture mode, where the video is flat and you choose what the viewer can see in the 360 space. Timelapse: You can shoot a variety of time-lapse interval videos at 5.7K, which look great! Battery Life: The battery should around 1 hour of continuous shooting when used without the WiFi connection. When the WiFi is on te battery is drained quicker. In reality the camera lasted around 4 hours of shooting on and off, and I made use the WiFi was used sparingly. To summarise; the One X is a better value camera with easier to use software, however the GoPro Fusion is capable of shooting slightly better quality video. The Fusion has better quality lenses which work better in low light an indoor situations. One advantage the One X does have is that it can shoot in LOG mode, which allows you to color correct your video with far more accuracy. I’ve found that shooting in LOG mode can lead to a more detailed and better looking video, but does require an extra step as well as some editing talent. The Insta360 One X is trying to be a tradition action camera as well as 360 VR camera, and to be honest it does a pretty good job at both. Even if you are not interested in shooting 360 video at all you should still take a look at the One X, because its new way of capturing ultra stabilized video surpasses anything a GoPro Hero can do. Ironically GoPro’s 360 camera, the GoPro Fusion, is better at shooting 360 video for virtual reality, but it’s also a few hundred dollars more expensive. In any case, shooting 5.7K video at this price and with this many features is a good deal, regardless if you want to shoot VR video or normal video. There are a few software problems to work through and I hope an update post release will sort out the too frequent app crashes, but otherwise this is looking set to be the must have 360 camera of 2018. It’s certainly worth an upgrade from the original Insta360 One and a pretty good option for your first 360 camera too. The Insta360 One X is available now from the Insta360 website. Use that link to get a free invisible selfie stick which is specially designed to work with the One X.
What’s your opinion on the Rylo vs the Insta360 One X? Personally, the availability of the scuba case for the One X is the deal-sealer for me, and eliminates the need for a GoPro. It seems like the app/editing features are almost identical between the two, leaning toward the Insta. hi, Thanks for great review! Trying to calculate memory card size, how much will 1 minute of 5.7K @ 30fps video take up? is the LOG mode take up more? How about in other fps? If placed in the middle of a round table at an event would it capture all the guests around the table. Thanks for the review. I would like to ask, if I shoot in LOG mode, can I do the colour correction on the phone app? Or I need to use a video editing software (either phone or desktop) to do it? very interesting review ! 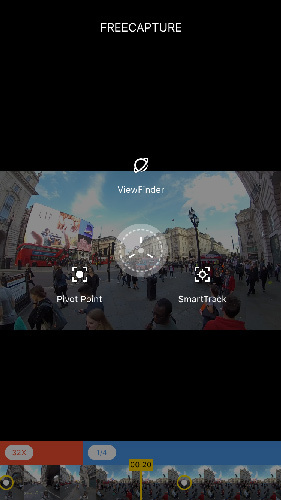 I try to find the metadatas of the pictures I take with he Insta360 One X, so I can access the GPS info, but without success! Nothing in the app is showing the way, and the website is poor in information. I don’t want the stats in video, I just want the gps infos to be linked to the photos; Do you have any advice? Thanks a lot 360 guy !